The Vancouver Canucks take on the ultimate home-standers, the Detroit Red Wings, Thursday in a game that should be a battle for Western Conference supremacy. It should be a game that is the statement games among statement games. A game that will have lasting ramifications that will carry into any potential playoff clashes between these two powerhouse teams. It should be all those things, but without Red Wings star Pavel Datsyuk in the lineup, it will fall just short of being that meaningful. Detroit is flying high at home, sitting on a fat juicy 23 game home winning streak. The Canucks, who have more road wins than any other team in the league come in trailing Detroit by only two points in the conference. This is the stuff of legendary games, or at least game of the week status. It is still the regular season after all. Datsyuk underwent knee surgery last week and is expected to be out for two to three weeks to recover. Normally, Detroit opponents would be breathing a sigh of relief to not have to deal with one of the league’s best players. While Kevin Bieksa, Dan Hamhuis and Ryan Kesler are probably glad they won’t have to fight through him, with the Red Wings best player sidelined, Vancouver can’t really win here. If they win the game and end the Detroit home streak it will come with an asterisk. Yeah you won, but they didn’t have Datsyuk. That’s all you will hear from the hockey punditocracy. And this is not some ‘Vancouver can’t get respect’ kind of thing, it’s just the truth. Beating the Red Wings without their best player is good, but the Canucks could not claim that they sent any kind of message for potential playoff meetings. The game turns into a regular season game without the extra mustard. Yes, the two points are crucial, but not any more crucial than the two points that were on the line Tuesday in Nashville were. The two points that the Canucks kicked away. If Datsyuk were healthy and the Canucks went into Detroit and ended the win streak, not only would they have picked up two points but they would have sent a message. The message would say that Vancouver can go into the toughest rink to play in and come away with a win. If these two teams were to meet in the post season, the confidence from a win like that would be valuable. Losing on Thursday not only will cost Vancouver in the standings but will look extra bad as it would come to a team that was short handed. It wouldn’t be the end of the world, as we are still in the regular season, but it would put Vancouver 0-2 at Detroit this season. 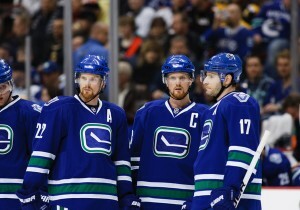 How confident would the Canucks be going into Detroit for Game 1 of say, the Western Conference Finals? Despite Datsyuk’s absence, the game Thursday will still be much watch television. These are still the two top teams in the West and maybe in the league. It is not a stretch to think that the road to the finals will have to go through both of these teams. Vancouver is 1-1-1 against Detroit this season and all three games have been up tempo, back and forth affairs that have been highly entertaining. 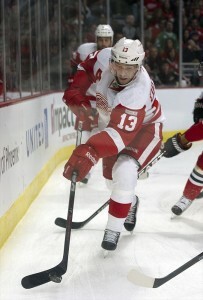 Losing Datsyuk will take some of the shine from the game but not all of it. The Red Wings roster is still loaded with top flight players that match up well with Vancouver’s strengths. Can the Canucks end the streak? For Vancouver, they have been winning games ugly for the past month but have shown signs of breaking out of their funk. They pasted Toronto and Edmonton this past weekend before dropping a 3-1 decision to Nashville on Tuesday. Despite the loss the Canucks did not play particularly bad. They moved the puck and generated a lot of shots and chances. All things that were not happening earlier, despite the wins. All of this points to a good outing from the Canucks Thursday in Detroit. The Canucks respect the Red Wings and have, on several occasions, stated that they want to model their game and franchise after Detroit. Considering Detroit’s success, that is not a bad plan. Expect a solid effort from the blue and green Thursday, and possibly even an end to Detroit’s win streak and a tie for the Western Conference lead. Just don’t expect it to mean anything else.